I am a salad fan. I love the crunch, the freshness, and the infinite possibilities of lettuce, vegetables and anything and everything. We put lettuce in a taco shell and call it a salad. Cook pasta and combine it with tuna and call it a salad. 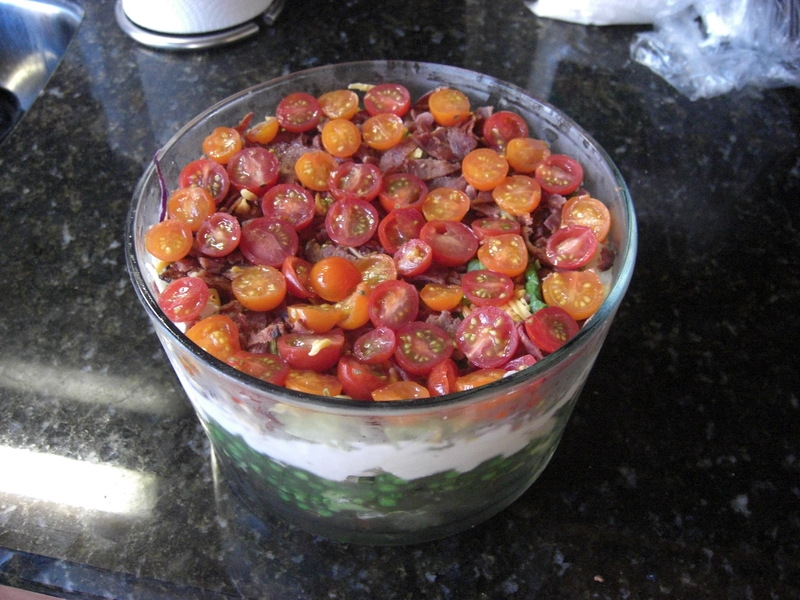 Mix three different beans and oil & vinegar and call it salad…now I give you salad in a trifle bowl: the seven-layer salad. The seven-layer stands right up there in my top five go-to salad recipes because it’s both pretty and delicious, if even a bit healthy. Oh, and it’s incredibly easy to make, can be made a day ahead of time and is great in both the summer and winter- cooling at a barbeque and a perfect addition to a Holiday table. There is one downside. It doesn’t last in the fridge as leftovers (meaning once its been mixed) for more than a day but in my house that is because it has been plotted against since the click of the Tupperware (and hence eaten). 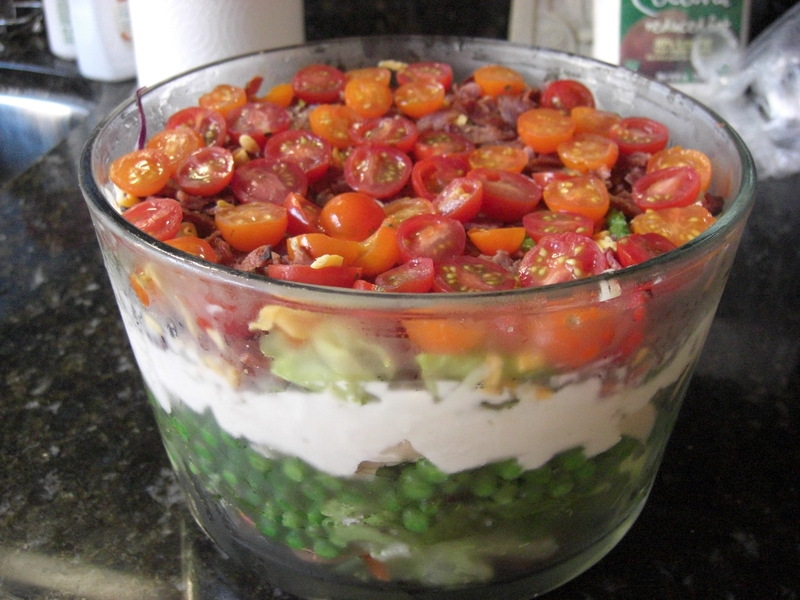 I guess it should be called the eight layer salad…there are eight main ingredients. The lettuce must not count? Place 3 cups lettuce in bottom of large bowl; sprinkle with salt, pepper and sugar. Layer in order peas, onion, lettuce and chestnuts. Spread mayonnaise over the top, sealing it to the edge. Sprinkle with sugar, then top with cheese and bacon. Place tomatoes on top. Cover and chill 24 hours.